We live in a world where media and apps are increasingly available only through recurring subscriptions. Besides the common Netflix or Spotify subscriptions, we may have subscriptions for our favorite apps, for iCloud Drive storage, for news publications, and more. Last year Bobby launched on the App Store as an easy way to keep track of this growing mess of subscriptions, but in version 1.0 the lack of a few key features – such as iCloud sync – hindered the app’s overall value. The recently released Bobby 2 remedies those few initial drawbacks, and presents one of the best App Store options for keeping on top of where your money goes each month. Bobby’s goal is to provide easy insight into the fixed costs in your life. 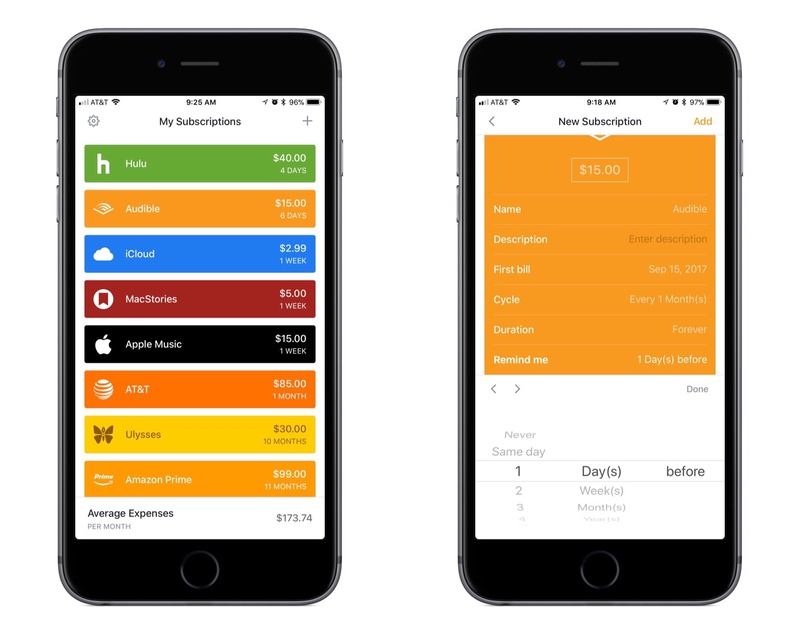 Once you get the app up and running, opening it provides a quick overview of all current subscriptions, sorted by the dates those payments are due. After you plug in your subscriptions, Bobby is a simple, attractive point of reference for seeing exactly where your money’s going. But the task of inputting subscriptions is still important, and Bobby excels at streamlining the process. Bobby includes a huge list of common subscription services built right in. You can browse the Popular list, scroll through all available options, or use the search option. If you don’t find what you’re looking for, there’s an option to create a custom subscription. In adding my own subscriptions, there were very few I couldn’t find in the app – even popular iOS and Mac apps like Ulysses and Bear are included in Bobby. Once you’ve selected a subscription, all you have to do is enter the price and date of billing, then you’re done. Optionally though, you can include additional notes about the subscription, change frequency from the default of monthly, and more. One of the most helpful options is the ability to set a reminder date so Bobby can notify you a set number of days or weeks before the subscription’s payment date. Bobby 2 improves on the debut app’s core experience with features like flexible payment cycles, but it also includes a handful of miscellaneous goodies that add up to a more full-featured service. Touch ID and passcode protection ensures that your subscription list remains private to you and trusted loved ones. iCloud sync prevents the possibility of data loss in the future – while the app is iPhone-only, scenarios like switching devices are no longer an issue. 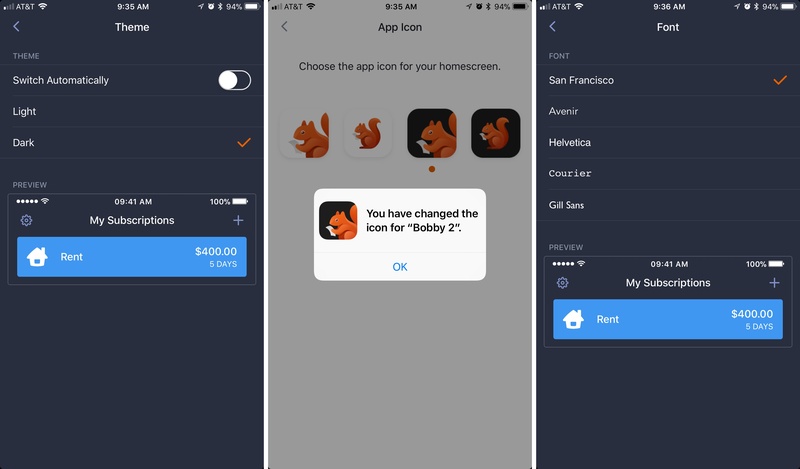 There are also some fun app customizations available, such as custom app icons, a new dark mode that can be triggered manually or set on a schedule, and several new font options to make the app your own. There isn’t a lot to write about with Bobby, but in this case I think that’s a good thing. A subscription tracking app doesn’t need to be particularly complex or have lots of power user features. I believe Bobby strikes the right balance of providing all the options and features most users will want, but not more than most users need. It’s an elegant solution to a simple problem: staying on top of your bills in an increasingly subscription-heavy world. Bobby is available on the App Store as a free download that allows adding up to five subscriptions. A $1.99 In-App Purchase unlocks the full app with unlimited subscriptions, iCloud sync, dark mode, and more.